These Glass Clip Picture Frames are Inexpensive! 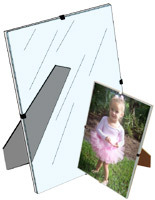 Portrait Holders are Sold on this Site in an Array of Sizes! 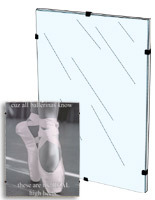 Most In Stock Items Including these Glass Clip Picture Frames Ship Fast! 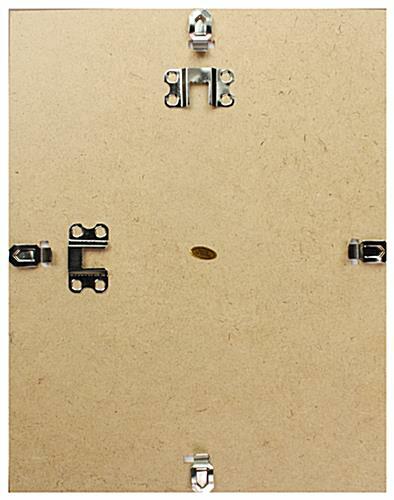 11" x 14" 16" x 20" 18" x 24"
Steel spring clips hold together 1/8" tempered glass panel and 1/8" chipboard back. 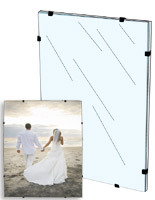 Affordable frameless 8-1/2" x 11" portrait displays are for wall mounting use. 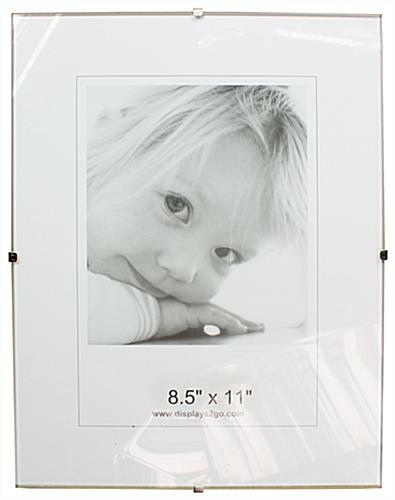 These glass clip picture frames are inexpensive and can be purchased in large quantities. 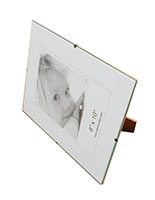 Each frameless photo holder is thin for hanging on a wall. These glass clip picture frames are frameless for a look that is timeless. Each document holder looks great in any home, office, or business décor. 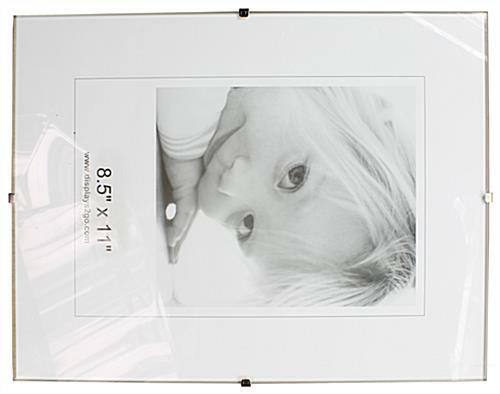 These frameless portrait holders are glass clip picture frames that hold diplomas. Each photo display holds a single 8-1/2" x 11" certificate. 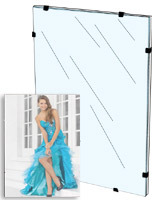 Frameless glass clip picture frames that mount on a wall can be hung either vertically or horizontally. Portrait hangers are designed so the signs will be the focal point and not the holder itself. 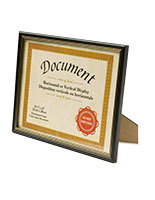 These glass clip picture frames, called frameless document holders are used to exhibit diplomas, ads, or portraits. 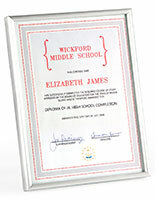 This certificate display is ideal for recognizing a person's achievements. These glass clip picture frames can mount on the wall with the attached hanging brackets. 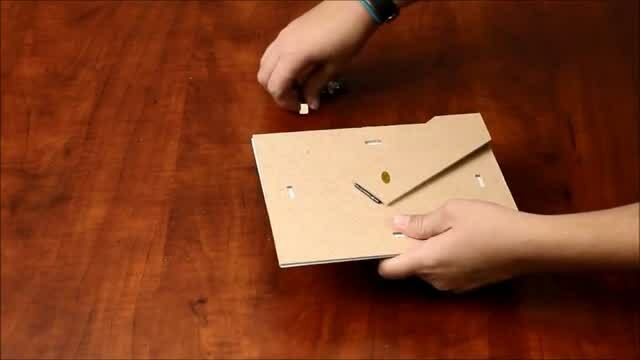 There are (4) steel clips that hold the backing and clear panel in place. These glass clip picture frames are made with a tempered glass lens, which is much stronger and safer than traditional glass panels. The clamps easily remove to change out the signs. 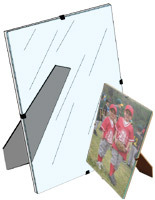 Glass clip picture frames that have metal clips make great favors and gifts. These portrait holders are great for handing out with certifications and awards at conferences. The certificates will be protected in these sign holders with the tempered front panel. 8.4" x 11.0" x 0.25"